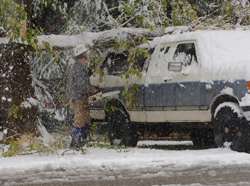 Nick Chickrell, of Arborcare Resources, gets ready to rescue a truck from under a large limb on Carbonate Street in Hailey. This was one of the many instances of damage caused by falling limbs during a snowstorm that brought about 8 inches of wet snow to Hailey Sunday and Monday. What’s happened 10 years later in Laramie?